Your career did not start with the Rondinaud company, a family business that bears your name and whose father is the CEO, why did you make this choice away from your relatives? I began my professional life in the media, to be more precise in the group NEXT RADIO TV which regroups BFMTV / RMC / RMC DISCOVERY where I spent 11 years from 22 to 33 years old. It was very important for me to make my own experience outside of RONDINAUD before returning to the family business. This experience has taught me a lot about myself and how I work, including teamwork and the importance of communicating well for a society like ours (Something we will be focusing on in 2017). What made you come back to Charente and why did you agree to work for the company that bears your name? Since I was young, I knew that I would come back to work for the company, but not really knowing when ... but after 11 years in the media, I thought it was time for me to come in and give a new meaning to my life. What do we learn by working 7 days a week with his father? By working in a company with his father, we learn more about each other and ourselves and we also try to master the qualities of the other in order to progress. It's not simple every day, we sometimes have generational conflicts, but overall I know that I must learn the most from him. Your business has existed for over a century, what have been the stages of development over the years? From 1907 to 1948, it was a craft company that made savates and clogs under the aegis of my great-grandfather, Théophile. In 1948, my grandfather James Rondinaud really gave the kick off impulsion for this company to become a real industry with more than 1,200 employees in the 1980s. At that time, our main customers were mainly retail and GSS. The WTO agreements in the 1990s opened up the European market to fierce competition from Asia, how did you deal with this opposition? In the late 1990s, the Asian presence and power almost overwhelmed us, but we continue to move forward with our great creativity, service and flexibility that emerging markets could not offer. But year after year, the volumes inevitably decreased, so we had to change markets and return to the DNA of our workmanship, that is to say to redo traditional Charentaises and to focus on the retail and high-end market. 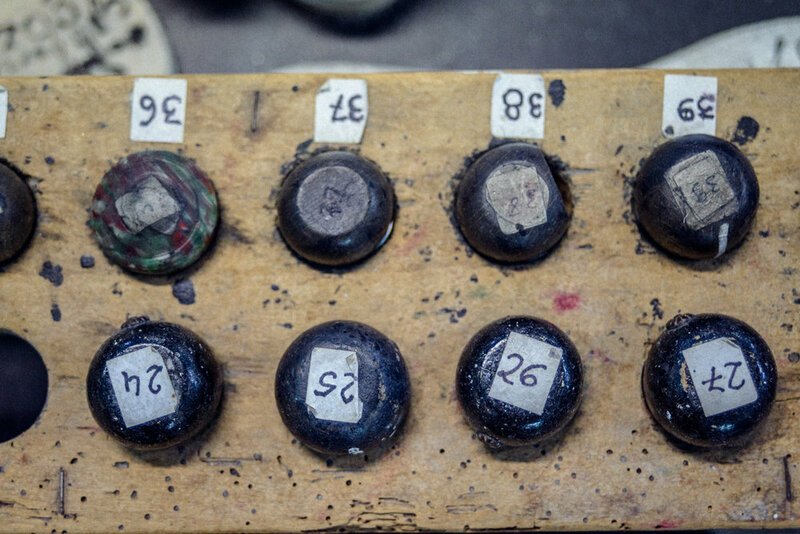 How can French handmade products fight against international competition? How should they position themselves? Our products have nothing to do with what we made in the 1980s (products in the broad sense: white sabot, ballerinas, Charentaise soles plastic ...), in terms of quality, raw materials and savoir faire. We have trained again the people working in our workshop with the sewn-back process, restarted old machines and found new suppliers in order to get more noble materials such as virgin wool, natural cotton jerseys or even cashmere. What vision do you bring to the company? What is your development plan for the next five years? I believe that today we share a fairly clear vision of the company, we will continue to develop the brand ETS RONDINAUD in the world of high-end products and especially develop new markets such as the United States, China , Korea, Japan, where we will consolidate and develop our brand.